An early morning walk with Daddy. Rising sun. With coffee in hand, of course. How can I sum up our trip to North Carolina? The adorable shape of Charlotte’s little footprints in the sand? Hearing her squeal as a wave tickled her feet? Reading on the beach? Drinking a glass of wine, hand in hand with my guy at sunset? We’re so grateful that we made it to the beach last week. As Hurricane Irene finished dumping her rain and knocking over trees, we Hofmanns left at daybreak, not knowing if we’d be able to check in or not. The realty office wouldn’t open until 9:00 a.m., but we couldn’t wait until then to leave. If we did, we’d miss our check-in window that afternoon. So, we hit the road full of hope, but we also knew better than to get TOO excited. At 9:00, I called the realty office from the road, but I couldn’t get through. I tried again and again. Not good. Once it was late enough on the West Coast, we called Chris’s folks, and they got online to the realty office’s site. There, they said that the phone lines were down due to Irene, but all tenants were to report at 4:00 that day as planned. I did my happy dance in the front seat, and southward we continued. The drive was interesting, as obviously a hurricane had barreled through 24 hours earlier. Trees had crushed cars, debris covered off-ramps, and you could see where a particularly strong gust of wind had broken through, as a whole line of trees would be toppled. Interestingly, I saw very few trees actually fallen on houses. Oodles of close calls and a couple blocked driveways, but from what I could see, homes had fared quite well. Check-in was blissfully uneventful. By the time we arrived, water and power had the town fully up and running. Finally, finally, FINALLY, we entered our rented house and were greeted by a beautiful high-tide view of the ocean. Then I promptly had to change a poopy toddler’s diaper, which was an appropriate reminder that, vacation or not, mothering duties are inescapable! The weather last week was perfect—tons of sun. 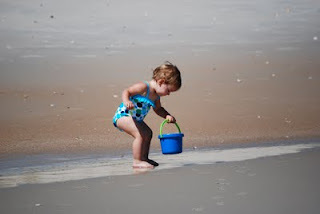 Charlotte took some time to warm up to the idea of sand (I couldn’t figure this one out, as she practically LIVES in the sandbox at school) and the waves terrified her, at least at first. 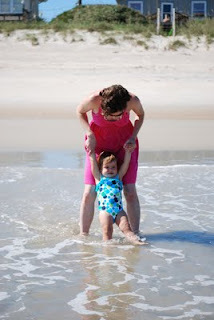 Eventually she got over it and thought the waves were super fun and not at all scary, but it took a long time of mommy holding her while we jumped over the waves, over and over again. Honestly, Charlotte’s naps were the most glorious part of each day. We’d bring the baby monitor onto the beach, and then Chris and I could be bums like everybody else, him reading the Wall Street Journal and me reading a book. 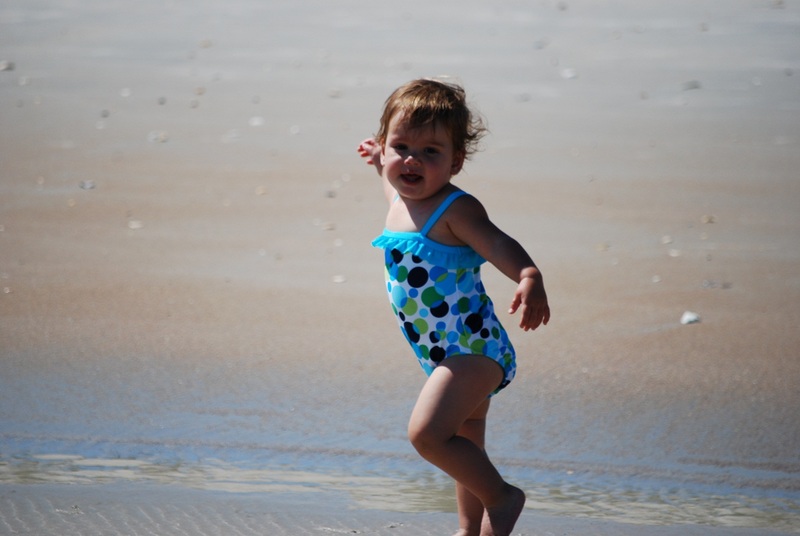 Of course, playing with Charlotte on the beach—once she was no longer so freaked out—was amazing. I thought I’d explode with glee myself, just watching my girl run freely along the beach, stopping here and there to collect a pretty sea shell or splashing in a tidal pool full of sun-warmed water and slippery mud. Unfortunately, Chris got a bit of a cold or something, which he quickly passed on to his daughter. On our last night there, Chris and Charlotte were hacking all through the night and the littler one kept waking up crying. I knew she wasn’t feeling too good, so I dragged my pillow to her room, where we had moved a twin-sized mattress to the floor in between two twin beds. I sleepily plopped down onto her bed and Charlotte fell asleep straightaway against me, staying that way until—blessedly—dawn. We ate out for dinner only once, which is one of the spectacular things about renting a house: you can cook your meals there! We had planned to go out at least one more time, but toward the end of the week, Charlotte was a bit edgy as she fought her cold, and expecting cheerful toddler behavior seemed like a bit of a stretch. So we stayed in. At any rate, we had a wonderful time. Sure, I had to remind my two Hofmanns that mommy was on vacation too, so could we stop assuming she was the maid? And yes, managing a toddler keeps you from totally checking out and relaxing. However, Charlotte went to bed at 6:00 p.m., which allowed Chris and me to have cocktails or wine on the deck, enjoying the ocean and each other. I told him that I’m a coastal girl at heart—I’ve always loved open water. Always. “I don’t want to go back to stupid inland Maryland,” I maturely told him. He didn’t buy it, but he did humor me and promise that if and when we’re ever in a position to buy a vacation home, we’ll seriously consider this little stretch of North Carolina coast, hurricane insurance cost be damned. The next day, as I sat on the beach reading during one of Charlotte’s blessed afternoon naps, I read an interview with an aged Lillian Hellman, who described her love of living near the coast: “Water is wonderful. Life goes on in it all of the time, all year around. There’s always movement.” I loved getting to read that a couple feet from the ocean. And I totally agree. It’s almost like the ocean acts as a buffer from feeling like life is . . . stagnant? Anyhoo, we loved Topsail Island. It’s utterly unpretentious (no Hamptons or Martha’s Vineyard crowds here, y’all) and folks are just quite genuine. And you can’t forget you’re in the South, with a capital “S.” Why, the local diner had the Ten Commandments on the wall behind the cash register, and the sign on the front door said, “In God We Trust—AND JESUS CHRIST.” Fortunately, we had our wedding bands on to display our child was indeed conceived in wedlock, so we felt pretty comfortable going right in. Our server was about 80 years old and super sweet, and as we left, she put her hand on Chris’s shoulder and said, “Y’all come back now, ya hear?” Like, for real. Now we’re home, and we return to work and school tomorrow. Sad, I suppose, but we’re so glad we had the time on the coast that we did. We absolutely intend to return next year, but you know how it is. Life and hurricanes can always disrupt the most well-made plans . . .